Most Sarnothi tech is controlled by gliding motions. Some items, like Sai Fen's stone carving tool, also utilize pressure sensitivity. What does “Get on the ball” means? This amusing little phrase says that someone needs to improve something. Your work is so sloppy. Get on the ball! Tom has been too lazy. He needs to get on the ball. Agent Brown is offering Todd a turn on his space hopper. You don’t know what a Space Hopper is?! You’re in for a treat! It’s a sports idiom that has spread to common, everyday usage meaning “focus on the task at hand”. That is an amazingly good definition. Better than the O.E.D. That is a great definition! Thank you. Agent Brown. It was the holidays and everyone was spending time with their family. Also if you were so dang worried why didn’t you just tell him to get it checked out? I am not sure that Agent Brown knew about it until now. When they walked in they were surprised that it was there, not just confident of what they would find. Although I find it interesting that Agent Brown is not only assuming Todd will admit that he has done some research but should be fully up to speed in all things Sarnothi (that he has clearance for) at this point. Wasn’t the school PTO meeting just a few weeks ago in comic-book-time? A month ago I believe. 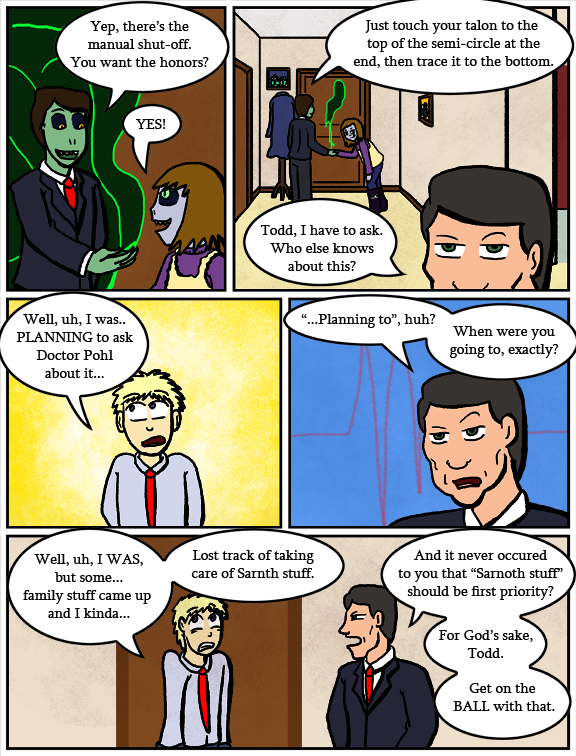 Last panel : Did Todd leave the o out of Sarnoth for real, or is it a typo? …It kinda slipped my mind. Doesn’t care or doesn’t know? He has no idea about Amanda, why would he? I read it as Brown doesn’t care about his *own* family. I seriously doubt he would have been approved to get Selkie (remember, Agent Brown vetted Todd before he was awarded custody) had he known about the McClellan Drama. For that matter, when does Amanda get brought into Selkie’s world? Gonna happen at some point, she’s clever enough to figure things out herself after a while. I mean, her SISTER has GILLS. She’s SEEN them and knows about her “issues”. At some point she’s gonna figure out that Pohl and any other Sarnothi she runs into have a common heritage, and she’s gonna FILL UP with questions. OK, I’m confused now. What exactly are Todd and Agent Brown talking about here? “Who else knows about this” sounds like it’s about the bow, but Pohl already does know about it! If memory serves the Smiths’ contact with the Pohl family outside the hospital wasn’t exactly sanctioned by Agent Brown, methinks Todd may be lying to avoid getting Pohl in trouble if Brown doesn’t approve. Not officially anyway. Brown knew about it and didn’t try put a stop to it. Brown is using Pohl as a way to tell Todd stuff Brown can’t tell him. All three of them know about this. sorry, left off the last sentence. Brown needs “plausible deniability” or he could lose his clearance and his job. OK, but “When” and “Get on the ball” seems to suggest that Agent Brown WANTS Todd to go ahead with that. Wait, isn’t doctor Pohl the one who’s family they visited? they already showed him the bow? And, based on the ‘lie-detector’ background of panel four (and the tone of his remarks), Agent Brown isn’t fooled at all. Not for one second. Lie detector background? Or heart beat P-T wave? Dave? What did you mean by that? I get that the alarm is annoying, but does it actually signal something? There’s a reason that manual cutoffs don’t exist for fire alarms (or are annoyingly difficult to get to). Silly Todd, Sarnoth stuff IS family stuff. I think he meant Amanda, but didn’t want Agent Brown to know. Umm…Wasn’t it Brown that basically insisted Todd NOT get Selkie involved in any Sarnoth stuff? True, but preventing abuse of a potential false alarm triggered by a government protected species is kinda important for everyone involved. Say Dave, I noticed Then’s facial markings are missing from Panel 1. Agent Brown: Todd, stop getting sidetracked by side-plots. This is the main storyline; get with it.